I had a blast with this issue. Bryan Hitch's art coupled with Robert Venditti's brisk plot made for the most fun issue of the series yet. With the recent news of Bryan Hitch's departure from this series after next month's issue, this issue had a sense of finality and emotion to it that I found really engaging. I think I've said this in most of my reviews of this book, but Bryan Hitch is genuinely getting better and better with each issue. His sense of scale hasn't changed since his Ultimates days, but it's his detail and inking, along with Andrew Currie's own inking, that has brought a dimension to Hitch's line art that I haven't seen before. There's emotion and power and weight to his characters that I haven't necessarily always seen in his previous work. There are so many characters in this issue and Hitch doesn't miss a step. Colourist Jeremiah Skipper has also been visibly improving. I think he and Hitch have come into their own now in terms of their collaboration and I love the warm vibrancy Skipper brings to the story. It's a big part in why each issue unseats the previous one as my favourite Hitch art. All the double page spreads are mind-blowingly pretty and I loved just slowly flipping through the book and admiring every aspect of its visuals. Robert Venditti doesn't move the plot along too much, but he makes up for it with including a whole variety of different incarnations of Carter Hall. A lot of them are hilarious, and Venditti manages to make each one memorable despite their brief appearance. 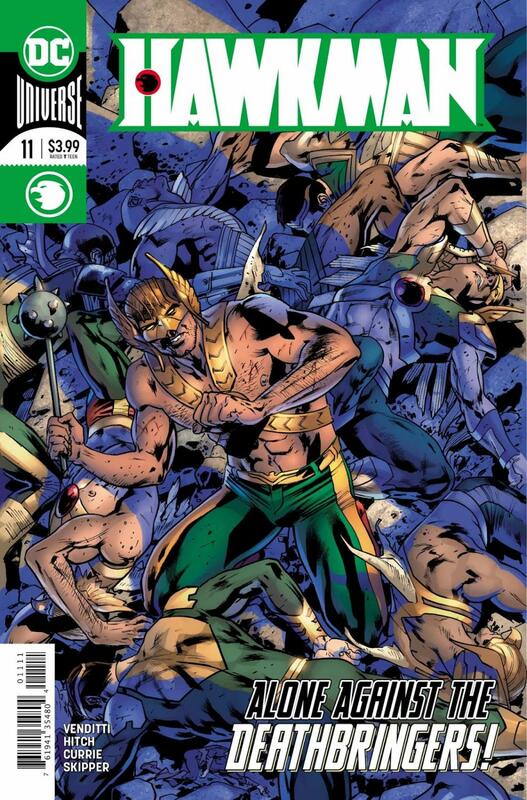 There are literally thousands of these characters so I was satisfied with his choice of Hawkmen. There was a revelation near the end of the issue that I felt wasn't set up well or earned at all. It just seemed like a wrinkle Venditti threw in to make the hero/villain conflict seem a bit more interesting or difficult, but it's a very minor issue. Visually, this is one of the best books you'll have read this week. Hitch, Currie, and Skipper are getting better and better each month and the result is plain to see. Venditti's story is great and I'm personally excited to see how this story concludes.